2. Naughty Squirrel Backpackers – one of the best hostels I've ever stayed in. I can’t exactly think why but I really liked this hostel. It’s right in the centre of Riga with incredibly friendly staff always offering a hand to help. Plus there’s a bar right next to reception offering a great little atmosphere and nothing too intense. 3. Everyone speaks English – as much as I hate this fact because I believe English speakers should attempt to learn another language, it's still pretty useful to get by with English when in another country. And when in the Baltics this is easily done. 5. Buses – the buses I took between the Baltics (Tallinn-Riga-Vilnius) were about €20 for four-hour trips with Wi-Fi. Sounds a bit of an odd reason to visit the Baltics but you could book these buses online, there were plenty of them and need I say it again but free Wi-Fi! On a bus! Is that even available in the UK? 6. 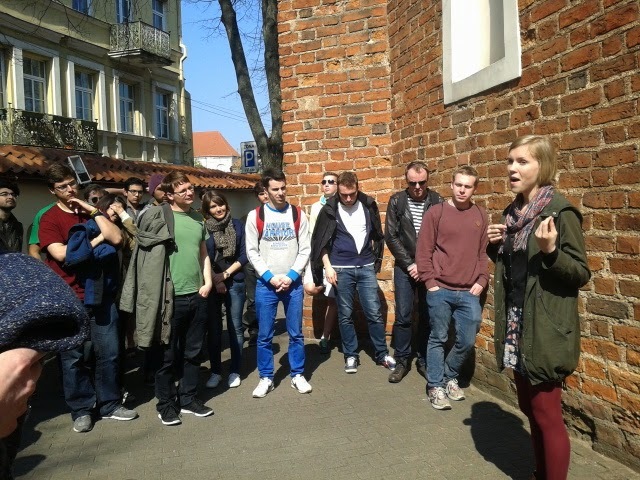 Walking tours – in countries such as the ones in the Baltics, but also similar in Eastern European countries, walking tours are common and they are free! Granted, you are pretty much obliged to tip but it’s always worth it. I don’t think free walking tours are as common in the more expensive European cities such as Paris, Berlin or London, so its great when you do come across them. Locals always run these tours, they’re also full of other backpackers and they’re never dull. The locals take you to the actually interesting places in each city rather than what you might get from an older, paid tour. 7. Liberation – in 1991 the Baltic Way took place which involved approximately two million people joining hands to form a human chain to show liberation from the Soviet Union. I find this a great part of history to learn about and it’s very apparent in the culture of these countries. Also, as these countries were liberated quite recently, you can see still some Soviet Union architecture in the capitals, which is also really interesting and different to any other European country I have visited. 8. Food – again, just like the beer, CHEAP! Dig right into the local dishes; you’ll be pleasantly surprised! And much to my joy and surprise, there was a hell of a lot of vegetarian options that were nearly all labelled separately on the menus. Try some dumplings, beetroot, pancakes and cabbage. Yep that’s right, cabbage, yum. 9. St Petersburg – even though I didn't voyage to the Russian city on this trip, I found out that you can get day trips from Tallinn to St Petersburg without needing to get a Russian visa. 10. Cost - Last and most importantly, these places won’t break the bank. Apart from the beer and food I have mentioned, everything is really reasonable. I paid around €10 for decent hostels and taxis are affordable enough to take a fair few. Overall, get on other to the Baltics! The capitals are beautiful, the people are friendly and it’s an awesome place to experience.